Luxurious, Black Velour Fur Felt (soft felt with deep, lustrous nap), 1920's-style Cloche. Victorian-style Black, Re-Embroidered Lace is swirled around Crown. Elegant, Black, Corded Sequin Trim is placed on both Underside and Outer Side of Brim Edge. 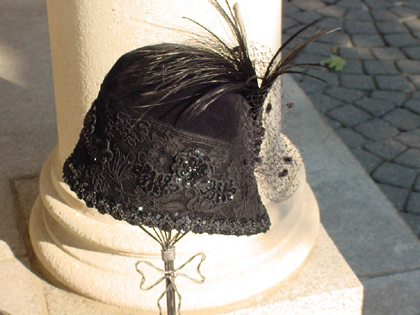 Soft, Black Flowing Feather (combination of Ostrich and Burnt Peacock Flue) on hat's side has Black Velvet Fabric and matching Black Sequin Trim with Open Hole Chenille-Dotted Veiling wrapped around Feather's Stem. Black Sequin Appliqués are placed around entire Crown. This hat is hand-blocked and hand-trimmed by milliner. Application of all trimming on hat is accomplished by hand sewing (no gluing). This is truly a haute couture creation that will catch the eyes of all who see you wearing this one-of-a-kind work of art. The bell-shaped Cloche hat is worn close-to the head and is a low fitting hat. Please see model in Fall Photo Gallery pictures. This hat is made for a standard 22-1/2 inch head circumference. Hair can be worn down, or long hair can be pinned near top of head in order to fit into extra space in top of hat's crown. In the 1920's, the Bobb cut was worn.